Who is St. Pius X? What is Stewardship at Saint Pius X? 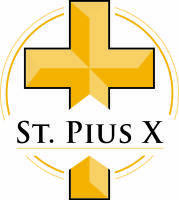 To become a member of Saint Pius the Tenth Catholic Church, please visit us in our Parish Office during business hours and a member of the staff will be happy to meet you and facilitate your registration. Our Parish Office is located inside the Simmons Parish Life Center at 2208 North Elm Street. We look forward to meeting you!